Old-timers to the hobby will recall that the U.S. Navy sponsored the AMA National Model Airplane Championships (Nats) competition each year from 1952 up through 1973. The following reprint of Bill Winter's editorial column in the March 1968 edition of American Aircraft Modeler (predecessor of Model Aviation) foretells the eventual break-off of the Navy partnership due primarily to the AMA's inability to attract a large enough percentage of juniors in the competition. Navy's motivation for sponsorship, which provided the venue (naval air station real estate), personnel, equipment, etc., was to promote naval aviation to the youths of America so that they would eventually enlist or be commissioned in to the service. Read the saga below. Check out the Vintage RC Systems page. WILL 1968 be the last of the Navy-hosted Nationals? Both the Academy of Model Aeronautics and the Hobby Industry Assoc. of America are on notice that, unless certain conditions are met in 1968 - or at least, that significant progress be made toward essential objectives - Navy may drop out of the picture in 1969. Simply stated, Navy's objections are a prohibitive expense in manpower and dollars, as well as failure on our part to fulfill the original Navy objectives (of 1948) in hosting the National Model Airplane Championships. It was exactly 20 years ago that Navy hosted their first Nationals -like 1968, also in Olathe, Kansas. 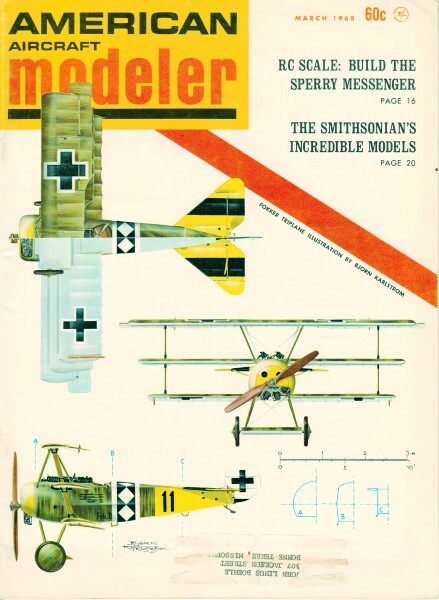 Their objectives at that time were: a) To encourage the interest of nation's youth and, more specifically, the aircraft model enthusiast in the U. S. Navy and thereby further, on a long-range basis, public-understanding of the national security; b) To encourage active participation by naval personnel in the model aircraft program. To these objectives have been added two more current requirements in keeping with changing times: a) To directly and indirectly strengthen the recruiting program; b) To enhance the Navy public image in areas of internal -relations, community relations, and public information. These current Navy objectives are being met, although great improvement is possible and, we may assume, more or less imperative. This, it is admitted, is a Navy problem. Navy we presume will, of its own accord, sharpen its aims this year in this area. However, the original objectives have broken down. "The participation of young people in the National Model Airplane Championships has steadily declined. ... During the 1967 meet ... the average age of contestants was 32 years," states Navy. Incidentally, AMA is desperately, and hard, at work on a youth tie-in for Olathe '68. This program is being built on the sensational success of the AMA Delta Dart (see Delta Dart: The Plane That Fooled the Experts, April, '67). If successful, and we believe it will be, this demonstration is expected to hold the line for follow-on developments essential to hold momentum during the 1969 Nats. Navy would like HIAA to help carry the load in 1969. How satisfied Navy will prove to be in the future depends upon the degree of progress, as related to overall costs. Navy must cut out the fat. There is an expensive "war" going on. Manpower costs, in training in this case, are at least as important as the cost in dollars. And with huge National budgets and deficits these days, the significant costs to Navy inevitably are critically scrutinized. What does it take to put on a Nationals? It costs Navy $150,000, of which $100,000 can be ascribed to such positive results as attracting people to Navy, and $50,000 for preparation, logistics, promotion, etc. Readiness training of selected air reservists at the host Naval Air Station is disrupted. This utilization of facilities and personnel is required during the week of the meet - in some cases preceding the meet for several weeks. Disruption of all normal routine affects administration at the NAS. Large numbers of enlisted personnel must be utilized to increase fire watches, mess cook duties, and police the station. The effect of this type of assignment upon morale and retention is undesirable. In plain English, a lot of chaps who are removed from our civilian life, wonder what our Nationals is all about .. Training schedules are disrupted due to the loss of availability of hangar spaces and adjacent area during preparation - for the meet, and the meet itself. Certain flights are not available, unless aircraft and personnel are pre-positioned at another, nearby military facility. There is a reduced aircraft availability for a week following the meet and there is a reduction in flight time. Obviously, all these problems are related to the length and the size of the meet. Does the meet have to be so big and complex; does it have to take so many days? Forgetting the constantly rising age levels of contestants, the problem of size is not new at all. Indications were given by Navy as long ago as 1961 that revisions would be wise. AMA Headquarters, through the regimes of two Executive Directors, has been sensitive to the need for corrective measures. An innocent bystander may wonder why action has not been forthcoming. The modelers resist any. suggestions that their event might be abandoned for Nats competition. AMA Headquarters does not dictate. It can't under its democratically constituted organization. So events remain that have virtually no connection with the everyday activities of the hobby. Extinct forms of models are sacrosanct. Nevertheless, some progress has been made in reducing the number of Nats events, and the number of days required for the Nats. Sterner measures must be expected. The same selfish thinking that has strangled junior participation competition by "pricing out of the market" suitable events, held us on a near collision course with disaster. In affect, the democratic machinery of AMA, where every regional and section and local voice must be listened to, has created what could be the world's largest committee. One is reminded of the old saying which states that a camel is a horse created by a committee. And what is the cost to AMA? It takes 150 people to run Nats events, 75 Navy, and 75 AMAers. Total AMA costs are $25,000, including things that must be bought, size of the Nats, flying should be limited to five days, thinks Navy, Wednesday through Sunday. The absolutely unavoidable requirements, if we are to have Navy-boosted Nationals, are personnel assistance from AMA and HIAA; and that the percentage of youthful contestants be markedly increased by 1969. These problems could, and must be solved. We believe that AMA has a fighting chance to meet its requirements. Unfortunately, the greater requirements - in that someone must raise significant funds - fall on industry. But the industry is incredibly disorganized. They lack member-to-member dialogue. HIAA spends large monies to fight glue-sniffing legislation. Will they support the modeler himself? Numerous radio-control manufacturers have no interest in HIAA. They don't need HIAA they say. They don't even exhibit at the Annual Trade Show. Numerous dealers don't belong to HIAA. What is left is old-time firms, such as Top Flite, Sterling - and how many can you name? - who, also in radio, still maintain a broad base. There are not enough of them. The radio people have their own association - but contribute little or nothing to sustain the whole hobby, even though their own futures are tied to a life-cycle of interesting youthful beginners in model aviation. Navy support cannot be defaulted. Nothing comparable will replace it. The Plymouth Internationals are long since gone. Also, the Air Youth program. Must Navy be added to the list? AMA is moving on these problems. But we cannot rest content on hard-core, middle-aged, specialist hobbyists. Because we do, the hobby is sick. The Navy problem is both a symptom, and a challenge. There is lastly the unrational belief that model building should automatically be supported by space-age industry, etc., in short, by "they." Why? We always argue that model airplanes are good for kids, off-set delinquency, teach skills, etc. So someone underwrites a meet only to discover that the modelers are as old as their own executives. This is always the problem. The older modeler, who once was a kid who did benefit (and wants it to go on) from various sponsorships, keeps a stranglehold on the competition picture. The reasons one hears why this or that cannot be done, are fantastically cockeyed. No one wants to leave out the Open-class modeler. In fact, Navy wants him, too. The "champ" adds color, and inspires the youngsters. If 2Q% of the Nats entries were Open Class, Navy could justify support. But at the last Nats, 57% of the entries were in the age bracket 30 to 79. Yes, they ran that old. Seventeen percent were 21 to 39, and only 26% five to 20. In this bracket, relatively few were in the Junior classification. Fifty-nine were 12 or under; 139, including these, 15 or under. We are lucky to have a 1968 Nats. If we have one in 1969 it probably will be due to a thing called the Delta Dart. rented or made-PA systems, telephone lines, equipment, barriers, signs, painting circles, etc. Income considered, AMA still loses several thousands of dollars on the Nats each year. Navy looks to AMA and HIAA to provide more support. What does AMA supply? Here's the list: 1) Contest director, event directors, and assistant directors; 2) Insurance coverage for contestants and events; 3) Instruction of Navy personnel in registration, judging, tabulation, timing, etc. ; 4) Publicity support;; 5) Selected items of equipment. What does HIAA supply? 1) Trophies (and AMA sweats blood to extract these trophies at considerable expense to itself, and with inconsistent results); 2) Sun helmets for event personnel; 3) Financial support for the Junior winners carrier cruise after the meet; 4) Publicity. Financially, HIAA as an organization, appears to suffer no inordinate strain thus far. Significantly, Navy calls attention to the fact that HIAA had, until five years ago (but not for many years, in actuality) a National Air Youth Competition, which was superimposed on the Nats. Regional competitions produced state champions, who then competed at the Nats for Air Youth National Champion. "This competition resulted in great Navy and news media interest," states Navy. Well, where is this valuable Air Youth program today? Dead for lack of financial support. People like Charlie Miller of Testor, Art Laneau, and Nat Polk - Nat more than any individual- made it go with their personal drive. But there is a limit to this sort of thing. If this program worked before, what is HIAA and AMA going to do about reviving it? The question demands an answer. Navy, at least, has recommendations. They are willing to go on - provided! Of AMA and HIAA they want registration teams, tabulation teams, trophy detail personnel, processors, clerical personnel, janitorial service for contestant work areas. They want a return to the original objectives of 1948.